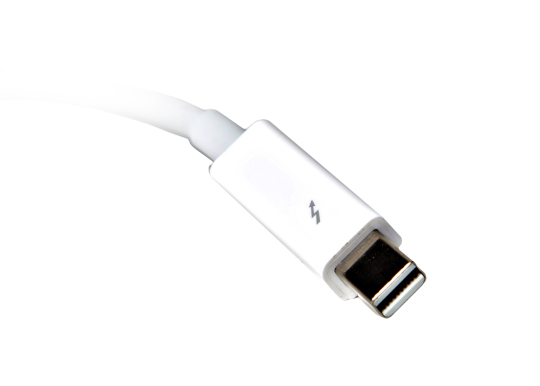 The Thunderbolt Display's connection cable looks a lot like Mini DisplayPort, doesn't it? Well, it's not and while you can plug last year's Apple Cinema Display into a Thunderbolt port and have it function, plugging the Thunderbolt Display into a Mac with only Mini DisplayPort will get you nothing but a blank screen. Iteration is something Apple is good at. Its 24-inch Cinema Display was good, but it appealed to an extremely small number of users. In 2010, Apple released a new version with an improved screen and by that time there were many more Mini-DisplayPort-compatible Macs in the wild, thus widening its appeal. With its Thunderbolt Display, Apple adds a superfast connection, as well as Ethernet, FireWire, and Thunderbolt. Note that the display is only compatible with Thunderbolt-compatible Macs, so in effect, we're kind of right where we started with the 24-inch Cinema Display: a powerful monitor that only a small subset of the market will be able to take advantage of. Still, if you do own a Thunderbolt-enabled Mac , you should definitely check out the full review of the Apple Thunderbolt Display. We originally had trouble getting the Thunderbolt Display to turn on with a MacBook running Windows 7 in Boot Camp mode. Apple did release a firmware update last week, however, and while we can't confirm whether there was a compatibility fix in it for our configuration, since the update, we've had no trouble. Lastly, though you can connect the display to a Mac running OS X and immediate have it turn on, when running Windows, you must restart the system in Windows and have it boot while the display is connected. The display does not currently support hot-swapping in Windows.